Since commencing operations in June 2014, the Singapore Sports Hub has established itself as the region’s premier destination of choice for sports, entertainment and lifestyle events. It has played host to the best in Live Sports and Entertainment events such as the 28th Southeast Asian Games, International Champions Cup, HSBC Singapore Rugby Sevens, international football friendlies, as well as internationally-acclaimed artistes like Madonna, Cold Play, Taylor Swift, Ed Sheeran, Bruno Mars, EXO and Jay Chou, among others. The hub is also a destination for community events, bonding Singaporeans and visitors alike through various sports and lifestyle initiatives. Its integrated approach to sports and entertainment ensures that there is something for everyone. As the centrepiece of the Singapore Sports Hub, get the best of live sports and entertainment at the 55,000 capacity National Stadium and enjoy spectacular views of the waterfront and Singapore city skyline. The iconic Indoor Stadium has hosted a wide variety of sports and entertainment events, including Western and Asian superstars, family entertainment, award shows, sports matches and other large-scale events. Comprising two blocks of multi-purpose halls, the OCBC Arena accommodates a full range of sporting activities. Whether you’re an athlete or a sports enthusiast, amp up your fitness level at the OCBC Arena today. Host to many marquee Aquatic events, the OCBC Aquatic Centre also offers a wide range of professional aquatic facilities for you to enjoy. Now you can choose to train while your family enjoys a relaxing swim! Escape into a world of water-soaked fun at the Splash-N-Surf! From the adrenaline-pumping Stingray® to the ever popular Lazy River, explore a variety of fun recreational water activities with family and friends! Rent a boat of your choice at the Water Sports Centre and enjoy a perfect day out on the water. Bring along your sense of adventure, and paddle down all 35 hectares of the beautiful Kallang Basin! Ever wondered what it's like to be a sporting hero? Explore the history of sports at the Singapore Sports Museum and find out how sports has changed Singapore today! Looking for a place to catch up on your weekend read? Enrich your mind or have fun with family and friends on our life sized chess set at the Sports Hub Library! Indulge your senses at the 41,000 sqm Kallang Wave Mall, where exciting retail, leisure and dining outlets await! Established under a 25-year long-term Public-Private Partnership agreement between Sport Singapore and SportsHub Pte Ltd, the Singapore Sports Hub is a is one of the largest sporting infrastructure projects in the world. It plays a critical role in building a sustainable and competitive advantage for Singapore’s sports and entertainment tourism industry. It also serves as a catalyst for the emergence of sports in Singapore, and helps Singaporeans to live better through sports - be it as a competitor, a participant or a spectator. The multi award-winning project is the first to combine world-class sporting infrastructure for football, athletics, rugby and cricket, with community lifestyle and entertainment facilities. SportsHub Pte Ltd is a consortium comprising four equity partners: InfraRed Capital Partners, Dragages Singapore, Cushman & Wakefield Facilities & Engineering, and Global Spectrum Asia. This handy fact sheet presents the fast facts on our plethora of facilities and programmes. Download now to discover the best of the Singapore Sports Hub! Spanning a mammoth 35 hectares of land in the heart of the city, the Singapore Sports Hub is one of the world’s first fully integrated sports, entertainment & lifestyle destination. Discover what makes the Sports Hub Singapore’s favourite sporting, entertainment and lifestyle destination! Sport Singapore and Singapore Sports Hub are thrilled to announce partnerships with world-renowned rugby legends – Fijian legend Waisale “The Wizard” Serevi, Australia’s highest-ever internationally capped player George Gregan, long-serving New Zealand Sevens captain DJ Forbes and compatriot Huriana Manuel, the New Zealand Black Ferns captain who led her team to the inaugural World Series title and World Champions title in 2013 – as ambassadors for the upcoming HSBC Singapore Rugby Sevens. Singapore’s adopted home team HITO-Communications SUNWOLVES will return to the National Stadium tomorrow to face last year’s Super Rugby finalist – the LIONS. This will be the SUNWOLVES’ second and final Super Rugby home match here in Singapore in the 2019 campaign. The team will be focused on executing a well thought out game plan to rattle and beat an unwavering South African side. Singapore Sports Hub and Singapore’s premier esports organisation, Team Flash, are collaborating on a cohesive talent development plan for 2019 which includes a professional esports training facility to develop local emerging talent in esports, in view of Singapore’s participation in this year’s SEA Games in Philippines and the next Asian Games 2022 in Hangzhou, China. The provision of a structured and conducive environment helps the athletes to focus in their training regime so as to develop local emerging talents to excel in esports. The HITO-Communications SUNWOLVES return to action at the National Stadium on Saturday, 23 March, where they will face last year’s Super Rugby finalist – the LIONS. Fans are encouraged to come support the teams and celebrate SUNWOLVES’ second and final home match here in Singapore this season. The 2019 edition of the HSBC Singapore Rugby Sevens is poised to be the best yet with organisers, Sport Singapore and Singapore Sports Hub, unveiling a series of exciting programming and entertainment acts when the series stop here on 13 and 14 April, targeting families, youth and event goers. Singapore’s adopted home team HITO-Communications SUNWOLVES will take on South Africa’s SHARKS at the National Stadium tomorrow, in the first of two Super Rugby matches in Singapore this year. The SUNWOLVES return to the Southeast Asian city state coming off their first historic win here in June last year against the Bulls. They will be aiming to kick off their campaign with a winning start to their 2019 Super Rugby season with Saturday’s opener. The HITO-Communications SUNWOLVES are back in Singapore this week for the highly-anticipated Super Rugby match against the SHARKS, and some players joined a local rugby training session this afternoon at Sembawang Primary School ahead of the big game. SportsHub Pte Ltd (“Singapore Sports Hub”) today announces that Mr Oon Jin Teik has informed the Board of his decision to leave his role as Chief Executive Officer, after the HSBC Singapore Rugby Sevens 2019 in mid-April. Sport Singapore, Singapore Sports Hub and Singapore Rugby Union today announced ticketing details for the 2019 HSBC Singapore Rugby Sevens, the eighth stop on the HSBC World Rugby Sevens Series 2019 calendar. Tickets go on sale today with an Early Bird discount offer through 28 February 2019. Enhanced crowd management measures will be implemented around the National Stadium in view of the expected capacity crowd for the upcoming BTS WORLD TOUR “LOVE YOURSELF” SINGAPORE on 19 January 2019, Saturday. The measures include tighter supervision as well as increased medical and toilet access during the queueing process. Visitors to the Singapore Sports Hub revelled in the festive ambience of the Christmas light-up, as over 20,000 played, participated and gave to charity on the first of the two-day festive edition of the Sports Hub Community Play Day. Themed “Season of Giving”, visitors participated in a host of activities including a series of carnival rides and games, an inflatable playground, sports try-outs, film screenings, stage performances and an inclusive runway show with opportunities to donate to charity. Tickets to see the HITO-Communications SUNWOLVES in action during the 2019 Mitsubishi Estate Super Rugby season will go on sale tomorrow, 1 December. Singapore’s adopted home team is set to return to Singapore to play two respective matches in 2019, including their first match of the season. On Saturday, 16 February, the SUNWOLVES will take on THE SHARKS at the Singapore National Stadium, and fans are encouraged to come out and support the teams and celebrate the opening match of the season. Saturday, 23 March, marks the SUNWOLVES match against the LIONS, their second and final match in Singapore. Members of the public can enjoy an early-bird discount of 15 percent for Category 1 and 2 tickets from 1 December 2018 to 15 January 2019. The Singapore Sports Hub will bask in photo-worthy visual treats of the dazzling neon glow of the Christmas trees light-up along the picturesque Kallang Basin, as it welcomes visitors to the year-end holiday season, replete with family-friendly activities at the Sports Hub Community Play Day on 1 and 2 December 2018. As Singapore celebrates the fifth and final edition of the BNP Paribas WTA Finals Singapore presented by SC Global, a symbolic art piece commemorating the tournament and the achievements of women in sports and entertainment was unveiled at the Singapore Sports Hub today. The Singapore Sports Hub today honoured the legacy of national sprinter, Mr C. Kunalan, with the unveiling of an artefact – a hand and foot cast of the 76-year-old – at the Singapore Sports Museum. The Singapore Sports Hub today received the National Safety and Security Award (Individual category) at the National Safety and Security Watch Group (NSSWG) Award Ceremony 2018 held at Orchard Hotel Singapore. The NSSWG award recognises members at the national level for their collaboration with the SPF and SCDF, in enhancing the safety and security of their workplaces. The Singapore Sports Hub basked with festivities as more 21,000 visitors gathered at the National Stadium for the first day of the two-day Japan Summer Festival, held in conjunction with Sports Hub Community Play Day at the National Stadium. A feast for the senses awaits visitors at the biggest Japan Summer Festival. This is held in conjunction with the 10th edition of the Sports Hub Community Play Day, at the National Stadium on 8 and 9 September. The stadium premises will be transformed into a gigantic festival ground with more than 100 Japanese F&B, games, and merchandise booths as well as a center stage featuring 25 sensational stage performances by 24 groups and organisations from Japan and Singapore. The Singapore Sports Hub was abuzz with fiesta activities as more than 18,000 clad in red and white, came together today to celebrate the nation’s 53rd birthday. The lively atmosphere was filled with familiar National Day songs as citizens and foreigners alike sang along and danced to the favourite tunes, and participated in a slate of family-friendly activities at the Sports Hub National Day Fiesta. Ticket sales for the first-ever Japan Summer Festival, to be held in conjunction with Sports Hub Community Play Day, has launched today, 7 August 2018, from 10am onwards. The 2-day event will take place on the 8 and 9 of September 2018, Saturday and Sunday, at the National Stadium. Members of the public can purchase tickets online from now till 7 September 2018 at a discounted price of $5. Onsite tickets are priced at $6 and admission is complimentary for children below 1.2 meters in height. The Sports Hub National Day Fiesta will make its return for the second year. In celebration of the nation’s 53rd birthday, Sports Hub brings to Singapore an array of exhilarating sporting and family-friendly festivities to ignite the spirit of ‘We Are Singapore @ The Hub’. Held at the OCBC Square on 9 August from 12pm to 9pm, visitors will be able to participate in fitness workouts, sports challenges and family bonding activities. The Singapore Sports Hub Festival of Football excitement reached fever pitch as approximately 4,500 visitors erupted in collective euphoria over France’s 4-2 victory against Croatia, totaling the attendance for the World Cup screenings at the event to more than 65,000 over the past month. The HITO-Communications SUNWOLVES are back in town this week for the highly-anticipated Super Rugby match against the BULLS. Some players joined in a kid’s training session this morning at Centaurs Astro Pitch, Turf City, ahead of the big game tonight. Singapore’s adopted home team HITO-Communications SUNWOLVES are set to take on South Africa’s BULLS at the National Stadium tomorrow in the only Super Rugby match to take place in Singapore this year. The last match between the SUNWOLVES and the BULLS in Singapore took place in 2016, where the BULLS won by a small margin, with a score of 27-30. The Singapore Sports Hub – Home of Singapore Football – saw more than 20,000 football fans and families at its inaugural six-week Festival of Football. The festival, a forerunner of the highly anticipated International Champions Cup, comprises family-friendly activities such as live World Cup screenings, football friendlies, penalty shootout games, and meet-and-greets with local football heroes, as well as exclusive ticket promotions to the 2018 International Champions Cup in Singapore matches. The Singapore Sports Hub – Home of Singapore Football – today kicked-off its inaugural Festival of Football, held from now till 30 July. The biggest celebration of the global game in Singapore, the Festival will see 55 football games screened live on a mega 66sqm LED screen, prize giveaways at every match, football merchandise and premiums, and a gamut of fun offerings for the whole family. From 26 May to 24 June 2018, Singapore Sports Hub has lined up 14 fun activities that families can do together this June holidays! Best of all, earn chops and exchange them for gifts! The Singapore Sports Hub is pleased to announce that the inaugural Singapore Sports Hub Festival of Football will be held from 14 June to 30 July at the OCBC Square. The festival is supported by strategic event partners Sport Singapore, International Champions Cup, Singapore Tourism Board, Football Association of Singapore and National Youth Council, and is held in conjunction with the Singapore Football Festival. The Singapore Sports Hub today announced that tickets for the 2018 Super Rugby match to be played in Singapore will go on sale on 1 April 2018, Sunday at 10am. The Singapore Sports Hub wrapped up a weekend of splashing fun with a record turnout of almost 30,000 visitors who thronged the Water Sports Centre, OCBC Square, and the Splash-N-Surf at the 2-day Sports Hub Community Play Day – Water Festival. The Singapore Sports Hub has opened the gates of the National Stadium to the public, with a series of free fitness workouts and community events to be held within the stadium for 12 days in March. The first of the two-day Sports Hub Community Play Day – Water Festival welcomed more than 18,000 visitors, who had the opportunity to try out various water-themed activities free of charge, such as the parent and child Aqua Groove dance workout, Aqua Zumba fitness class, and half-pipe surfing facility Stingray®, amidst other community programmes across three venues, OCBC Square, Water Sports Centre and Splash-N-Surf. The Sports Hub Community Play Day makes a splashing return on the 10 and 11 March, with a slate of exciting water-themed activities to take water sports enthusiasts, fitness lovers and families alike on a two-day water festival. On the 1st of February this year, HG Sports Turf (HGST), Australasia’s leading stadia pitch design, construct and maintenance company, and partner of the Singapore Sports Hub in turf supply and maintenance, completed their contract work for the Singapore National Stadium (NST). The Football Association of Singapore (FAS) and SportsHub Pte Ltd today officially signed a Memorandum of Understanding (MOU) to play a minimum number of matches at the Sports Hub. The Board of Directors of SportsHub Pte Ltd is pleased to announce the appointment of Mr Oon Jin Teik as CEO of the Singapore Sports Hub, with immediate effect. The Singapore Sports Hub basked with festive cheer as close to 14,500 participants gathered at OCBC Square and took part in a series of fun-filled activities. Celebrate the season of giving at the Sports Hub Community Play Day on 2 December 2017, from 9am to 7pm. The Singapore Sports Hub was a hive of adventure-seekers, sports enthusiasts, and families as more than 18,000 participated in a Super Warrior-themed Sports Hub Community Play Day today. The Sports Hub Community Play Day returns on 16 September 2017, 9am to 7pm, at the National Stadium with a series of obstacle course challenges geared for participants of all ages to test their own “warrior skills”. The Singapore Sports Hub celebrated the Nation’s 52nd birthday with a sporty theme today, as close to 12,000 visitors attended the Sports Hub National Day Fiesta. Celebrate our nation’s 52 years of independence as One Sporting Nation at Sports Hub National Day Fiesta on 9 August 2017, from 9am to 9pm. In view of the expected capacity crowd, enhanced entry screening measures similar to the NDP2016 will be implemented around the National Stadium for the upcoming International Champions Cup Singapore. The Singapore Sports Hub rounded off another successful Community Play Day as close to 21,000 participated in the two-day event over Father’s Day weekend. The first day of the two-day Sports Hub Community Play Day kicked off in spectacular style with over 10,000 participants. Embark on a nostalgic journey this Father’s Day weekend as the Sports Hub Community Play Day returns on 17 and 18 June 2017. Due to the current licensing requirements for events, additional security measures have been implemented at the Singapore Sports Hub. These measures are expected to significantly increase the time taken to gain entry into events at the National Stadium and Singapore Indoor Stadium. The Board of SportsHub Pte Ltd (“SHPL”) today announces that Manu Sawhney has resigned as Chief Executive Officer and will be leaving SHPL, effective immediately. SUNWOLVES players visited the Singapore national wheelchair rugby team during their training session on Friday night and conducted a rugby clinic with 50 children this morning. Super Rugby 2017 is back for the third and final match in Singapore this year as SUNWOLVES take on the Sharks at the National Stadium tomorrow. Back for their second match in Singapore, the SUNWOLVES conducted a kids rugby clinic at GEMS World Academy in Yishun earlier today ahead of their game against the Stormers. Super Rugby 2017 is back at the Singapore Sports Hub again this weekend, with SUNWOLVES and Stormers gearing up for their match at the National Stadium tomorrow. The Singapore Sports Hub rounded off a successful first season of Sports Hub Community Play Day (CPD) with over 7,500 participants (as at 5pm) on Saturday. Singapore Sports Hub celebrates the completion of its first season of the Sports Hub Community Play Day initiative with a water-themed day of activity on Saturday, 11 March . Four SUNWOLVES players held a rugby coaching clinic at the Yio Chu Kang Stadium today before their first match against the Kings. Singapore’s adopted home team, the HITO-Communications SUNWOLVES, and South Africa’s Southern Kings are set to face off at the National Stadium tomorrow. The HITO-Communications SUNWOLVES and Kings have arrived in Singapore, and are all set for their exhilarating Super Rugby match this Saturday at the Singapore National Stadium. The second rugby season at the Singapore Sports Hub will kick off with an action-packed Super Rugby game between HITO- Communications SUNWOLVES and the Kings on Saturday, 4 March. The Singapore Sports Hub today announced the curtain raisers preceding the three 2017 Super Rugby matches at the National Stadium, which comprise of players from the top rugby clubs, former National rugby players and ‘A’ division schools. This weekend (11th to 12th February 2017), the Singapore Sports Hub will host a ‘Multi-sport weekend at the Hub’, a fun-filled pair of days that brings the community together through sports . Sports Hub Community Play Day 3 kicked off with a Christmas Zumba warm-up session with Ms Grace Fu, Minister for Culture, Community and Youth at the OCBC Arena. HITO-Communications SUNWOLVES player Ed Quirk today becomes the first sportsman to ascend the National Stadium roof since the opening of the Singapore Sports Hub in June 2014. The Singapore Sports Hub today announced that tickets for the 2017 Super Rugby Season will go on sale on 13 Dec 2016, 10am. The Singapore Sports Hub today unveils ‘Graceful Grit: Tennis and the WTA Finals in Singapore’, an exhibition celebrating the evolution of tennis and its journey to the Sports Hub. The largest Experience Sports Zumba workout was held within the National Stadium during the second edition of the Sports Hub Community Play Day. The Singapore Sports Hub today announced that the second edition of Sports Hub Community Play Day will take place on 17 September 2016, where visitors can look forward to a slew of activities. The Singapore Sports Hub today received a Top 50 Engineering Feats @ IES-SG50 award at The Institution of Engineers, Singapore (IES) Golden Jubilee Gala Dinner at the Ritz Carlton Millenia Singapore. Following a historic win in Tokyo three weeks ago, Japan’s HITO-Communications Sunwolves is back at the Singapore Sports Hub, all set to take on South’s Africa’s DHL Stormers. Football With A Heart (“ FWAH”; Chinese translation 足球传爱心) is back! Come 21 May, 42 corporate teams will don their jerseys for the 5-a-side football charity tournament at the Singapore Sports Hub, raising funds for nine beneficiaries. The National Stadium at the Singapore Sports Hub will host the inaugural women’s rugby test match on 14 May between Singapore vs Hong Kong. The HITO-Communications Sunwolves today held a coaching clinic at the Farrer Park field for 30 children mainly from the Japanese Community in Singapore. 25 Singapore rugby players headed to the Yio Chu Kang Stadium pitch for a joint training session with players from the HITO-Communications Sunwolves on Good Friday. Two of Singapore’s top rugby teams take to the pitch at the National Stadium on 26 March 2016. Before the Sunwolves’ first match today in Singapore, their adopted home venue, they held a clinic for close to 50 children, who were mainly from the Japanese Community in Singapore. The HITO-Communications Sunwolves are looking to up the ante when they face South Africa’s Toyota Cheetahs at the Singapore Sports Hub tomorrow. Ahead of their Singapore debut this Saturday, the HITO-Communications Sunwolves shared trade secrets with the Singapore national rugby team in a training session at Yio Chu Kang Stadium. With world-class rugby set to hit fever pitch with the season of international rugby kicking off this Saturday, 12 March, the Singapore Sports Hub today declared the facility ready for rugby buzz. The Singapore Legends will be returning to the National Stadium this Saturday, 12 March 2016, to take on the formidable Japanese Dragons in a curtain raiser ahead of the first Super Rugby game . Singapore Sports Hub and Rugby Singapore today announced a long-term strategic partnership to host the Singapore leg of the HSBC World Rugby Sevens Series at the Sports Hub. The Sports Hub announced today that the facility welcomed over 3.5 million visitors in 2015. World-class rugby hits fever pitch as Super Rugby 2016 rumbles into Singapore, and the SUNWOLVES, who will be playing three matches in Singapore have announced their team updates for the upcoming season. The Singapore Sports Hub today further enhanced its unique set of water-based offerings for the community by launching new family fun pedal-craft to the public. The Singapore Sports Hub received the 2015 SCDF Company Emergency Response Team (CERT) Award, presented by Mr Eric Yap, Commissioner of SCDF. The second segment of the Singapore Sports Hub Stepper 2015 commenced today at the National Stadium. The Singapore Sports Hub Stepper 2015 took flight today at the National Stadium. The Singapore Sports Hub Stepper, which is set to take place on Saturday, 3 October 2015, will be postponed if the three-hour Pollutant Standards Index (PSI) exceeds the very unhealthy mark of 200. The Singapore Sports Hub today announced the “Singapore Sports Hub Charity Fitness Workout 2015” which will be held inside Singapore’s iconic National Stadium on 24 October 2015. The Singapore Sports Hub today launched the “Singapore Sports Hub SG50 Carnival” – a two-day carnival being held over the Jubilee Weekend on 8 and 9 August 2015. The Board of Directors of Sports Hub Pte Ltd (Sports Hub) is pleased to announce the appointment of Mr. Manu Sawhney as its new Chief Executive Officer (CEO). 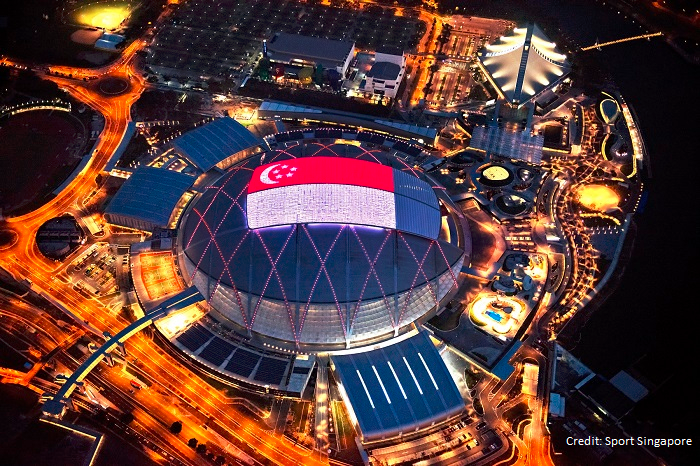 The Singapore Sports Hub today announced the “Singapore Sports Hub SG50 Carnival” to celebrate the country’s 50 years of independence on 8 and 9 August 2015. The Singapore Sports Hub today officially unveiled the “Singapore Sports Hub Stepper” at the National Stadium which is set to take place on 3 October 2015. After two days of the OCBC WaterFest 2015, an estimated 15,000 people turned up at the Singapore Sports Hub to soak in the fun and experience the festival’s offerings. For customer queries, kindly contact our customer care team by filling up the form here or call us at +65 6653 8900. Kindly note that the above email address is for queries from the media only. We regret to inform that we may not be able to respond to non-media-related queries via this email. Thank you for your understanding. Our Vision: To be the region’s premier sports, entertainment and lifestyle destination. Our Mission: To make Singapore Sports Hub an icon of national pride through the creation and delivery of extraordinary experiences that bind us all – be it as a competitor, participant or spectator. Our Corporate Purpose: To deliver on the project for Singapore, and ensure returns for our shareholders. • Integrity - We do the right thing even when no one is watching. • Passion - We love what we do. • Ownership - We own with pride. • Teamwork - WE are Team SportsHub (not ME). Request for a proposal on our partnership opportunities tailored to your organisation’s needs and speak to us for more information today!